Sixth draft... Are there any unclear explanations or wording in this? In particular, I think how the extras and stretch goals work is going to drive people up the wall, but I want to make sure I'm at least explaining it correctly. 1€ Level 1: Ref Book Haters! You don't want the Ref book, but you do want some of those sweet, sweet extras, so you can use this perk level to get those and to hell with the Ref book! 10€ Level 2: Electronic Edition! You will get the PDF edition of the new Ref book when it's ready, plus PDFs of any stretch goal adventures! You can still add on physical extras if you want. Voucher for the cost of the Ref book (standard edition with the Malcolm McClinton covers) + all stretch goal adventures for the LotFP store. You will pay shipping for these items through the LotFP store when the book is released. You also get the PDFs of these books. The Ref book will have two bookmark ribbons, exclusive for backers. Voucher for the cost of the Ref book (exclusive version with the Yannick Bouchard cover) + all stretch goal adventures for the LotFP store. You will pay shipping for these items through the LotFP store when the book is released. You also get the PDFs of these books. 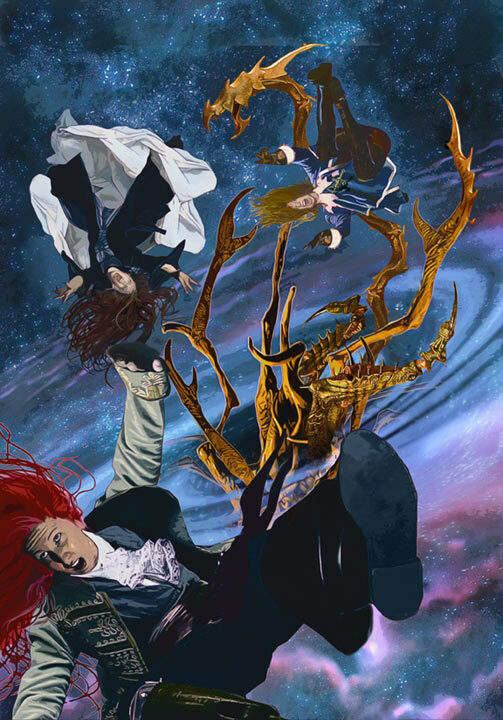 The Bouchard cover art will be exclusive to this version of the Ref book and will not be used by LotFP again. This version of the book will be numbered! The Ref book will have two bookmark ribbons, exclusive for backers. 60€ Level 5: Both Editions COMBO! Voucher for the cost of two Ref books + all stretch goal adventures for the LotFP store. You will pay shipping for these items through the LotFP store when the book is released. You also get the PDFs of these books. You'll get both versions of the Ref book, and both will have two bookmark ribbons, exclusive for backers. You get a base 20 copies of the regular edition of the Ref book (with the two bookmark ribbons - you're a backer!) with free shipping. See the notes on getting additional copies and substitutions at the end of the main project description before buying in to this perk! Notice 1: IndieGoGo requires payment up front when you make your pledge and this cannot be lowered after the fact (and can only be raised by making a new contribution). Be very sure before you hit that payment button. Notice 2: This campaign is set up very differently than most crowdfunding campaigns. Read the descriptions carefully. If you have any questions, please drop a line to lotfp@lotfp.com or leave a comment at the tab above before laying down your cash. 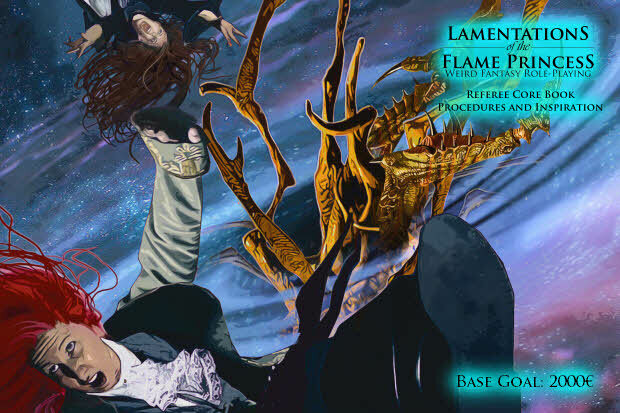 Lamentations of the Flame Princess is a tabletop RPG company based out of Helsinki Finland, and Weird Fantasy Role-Playing is a horror/fantasy/adventure RPG. 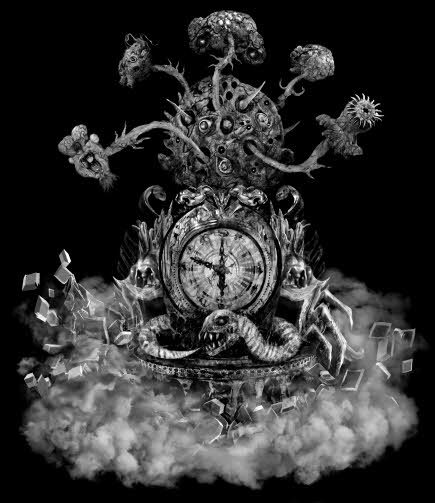 It is wildly imaginative and uncompromising, with top notch production values, striking art and a heavy metal attitude. 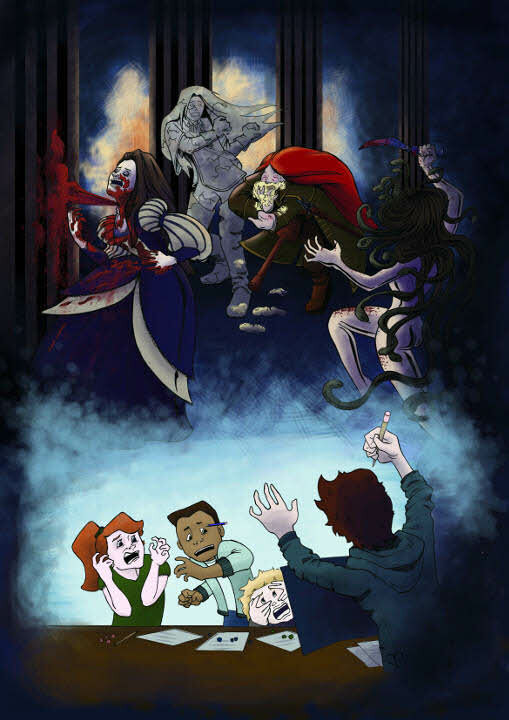 You can download a free version of the core rules without the artwork here and check out the guts of LotFP yourself, and you can download a fully illustrated 180 page LotFP adventure at no charge here. You can see a gallery of previously published art (and even some art that will be included in the Ref book this campaign is funding!) here. Not safe for work. You can buy current LotFP releases at the LotFP Webstore. Most of our releases are in the distribution chain, so you can get them at your local store, but the newer books (including the new Rules & Magic) won't go to distribution until the Referee book is printed. The previous edition of LotFP (the "Grindhouse Edition") is just about sold out. We're out of copies at the LotFP headquarters, and there are few copies left in distribution. We need the core in print. The Rules & Magic book (basically the player book) has been printed and is on sale from the LotFP webshop in Finland, but the Ref book has not yet been printed so the new version of the game as a whole cannot yet go into the retail chain where it attracts new fans. We could go to press right now effectively reprinting the Grindhouse Ref book as a hardcover, but that's not good enough. It needs the professional layout and presentation to match the Rules & Magic book. And it could use some new art, additional editorial input, and all the great things that money can buy but that small publishers have problems financing out of pocket since they're not essential to the production of a book for it to still turn out pretty good. So we here at LotFP hope you help to finance all of that and make this Ref book one that will both completely bury the previous editions of the book and be impressive enough to attract legions of new fans! It'll be in hardcover. More durable, more impressive. It will have fresh editing. It will have a professional layout to match the new Rules & Magic book. It will also have expanded content. LotFP is a living, growing game and so the advice in the book needs to be updated. But it will not replace the old advice, rather it will be presented alongside the previous advice in the book to highlight the fact that there is no one right way to play the game. It will have a new introductory adventure, Lost Inn Space. It will have a brand new section with tons of crunchy play aids, including a brand new creature generator (specializing in extra-dimensional mockeries of reality) with an expanded roster of sample monsters (but still no official game bestiary! ), adventure generators, and all sorts of (hopefully) useful charts and tables to make adventure creation easier that will ensure that you keep this Ref book at hand when preparing your next session. First, the Levels 3 - 5 Perks DO NOT INCLUDE SHIPPING COSTS. What will happen is when the book is ready, you will receive a coupon code for the value of the Ref book (or two), and you will purchase it from the LotFP Webstore, paying the regular shipping costs at that time (and adding whatever other items you wish at the time). Many crowdfunding campaigns, even ones that are on schedule, either wind up producing larger books than originally planned (which should be a good thing for everyone, right?) or the post office raises their rates between the time the campaign ends and fulfillment begins. It has turned seemingly profitable crowdfunding campaigns into a shipping cost grinder that causes the loss of thousands of dollars. The estimated weight that this Ref book will be is 500g. Economy shipping for a 500g book would be 7,50€ according to current rates. 1000g for the 2-book perk would be 10,00€ to EU addresses and 12,50€ to non-EU addresses. But the book may be bigger. Or smaller. But to the customer's advantage here, the extras will be added to those shipments at no added charge. And if we load up on stretch goals increasing the retail price of the book, Perk Levels 3-5 still get you the voucher for the full price based on your backing of the project here. And then we can just add the value of any Stretch Goal Adventures to the voucher, and as each of those books is estimated to weigh about 75g, that would result in no increased shipping cost if just one stretch goal adventure is funded (and just a 2,50€ increase for non-EU residents if more than one stretch goal adventure is funded). But again, those are all according to current postage rates, which may change at any time and we don't get much advance notice, and that's why we're not just adding 7,50€ to the cost of the perk levels and calling shipping costs covered. Second, Extras bought will not automatically count towards stretch goals. Extra bits and stretch goals have also been a frequent financial killer of "successful" crowdfunding campaigns. Publishers want to give you lots of cool stuff and extra tidbits. We really do. But this stuff costs money to produce. If you're running a campaign and you say the stretch goal for the next big improvement to the book is 2000€, and you get there because people bought 200 10€ fiddlydoos, and those fiddlydoos cost 5€ to produce... congratulations, you're on the hook for both the stretch goal improvements and the fiddlydoos, and you're down 1000€ out of pocket. But I still want to offer stretch goals, and I still want to offer fiddlydoos. Some of the extras have absolutely fixed costs. These are the Commentary, New Monsters, and Personalized Art extras. Half of each purchased extra will go towards the costs of the extra (paying talent! ), the other half will go towards stretch goals. Thulian Echoes will have half of each purchased extra go towards production costs for that adventure (its art budget in particular will be wholly dependent on the money the adventure earns), and half goes towards campaign stretch goals. The other extras (Slipcase, Screen, Shirts, Dice) will not count towards stretch goals at all until their own costs are cleared. At that point all "profit" from each item will go towards general campaign stretch goals. (and the more that are produced, the less each individual unit costs). Think of it as mini-embedded sub-crowdfunding campaigns. Because while some of those prices allow break-even to come relatively quickly (the dice in particular), those pricey Slipcases and Ref screen are listed pretty much at cost for 100 units. Get them while you can. Now, IndieGoGo is not set up like a shopping cart, so if somebody picks Level 3 (30€ base) with 100€ in extras... I won't know whether that's going towards shirts or slipcases or Commentary or what. You can be helpful and email lotfp@lotfp.com right after pledging to let me know where you want your money allocated, to help us know where we are in relation to stretch goals. Otherwise, this tally won't happen until after the campaign ends... leaving a very good chance that we won't know about what stretch goals will be reached until after the campaign ends! Also, the budget for each extra and all stretch goal amounts assume that IndieGoGo + Paypal will take 10% of all pledges in as fees. That's worst-case scenario, with 8-9% in fees being more typical. After the campaign ends, I will know exactly what percentage has been taken in fees, and adjust the stretch goal costs. So it is possible yet again for stretch goals to be achieved after the campaign ends. And that's how LotFP is going to attempt to run a fiscally responsible crowdfunding campaign where all the money goes where it's supposed to go and you get the best frickin' book possible and nobody goes broke delivering it. Seems a better solution than inflating stretch goals by guessing what proportion of extras vs. core rewards people will choose. Each of these extra items may be added to your pledge. You may add multiples of each item if you wish. These prices already include shipping costs. 50€ New Monster by Rafael Chandler and Aeron Alfrey! "LotFP doesn't have a bestiary!" I'm sure you've heard that one before. Well... there will be an expanded selection of sample monsters. But this is your chance to expand that even more! Rafael Chandler and Aeron Alfrey will team up to write up and illustrate a new monster for the Sample Monsters section. 45€ Personalized Olli Hihnala Art! Artist Olli Hihnala will do a one-of-a-kind sketch for you inside your copy of the Ref book. (If you are getting both Ref books, the sketch will go inside the limited version.) Your perks would ship later than they otherwise would because of course Hihnala would need time to receive and work through the books to be sketched in. When the new Referee book's text is finalized, your choice of Frank Mentzer, Michael Curtis, Kenneth Hite, or Zak S will read through it and offer at least 100 words of commentary/suggestions/advice where they see fit, to be included in the final text of the book. Every Commentary! extra added by a backer means at least 100 more words of commentary, expanding the scope of the book for everyone! A nice thick (1.8mm board) full color slipcase designed to hold this Referee hardcover and the Rules & Magic hardcover (which is not included in this campaign, but is available for purchase here), with brand new artwork from Olli Hihnala. This extra includes JUST the slipcase, not any books inside! A large (estimated 21x89cm) three-panel Referee screen on heavy 2.5mm board with full color art by Matthew Ryan on one side, and a load of reference charts - many not in the Rules & Magic or Referee book endpapers, on the other! Black T-shirt with wild Aeron Alfrey artwork! Sizes Ladies' S-XXXL, Mens' S-XXXL. Printed on preshrunk 100% cotton Gildan Heavy Cotton shirts. (add 3€ for sizes XXL and above). "When Titus sacked Jerusalem, it is said that during the chaos an enterprising sorcerer made off with a King's ransom in silver and disappeared to far off Thule. A century later an enterprising party of explorers made a failed bid to reclaim it. Armed with their notes, are you able to succeed where they failed over a thousand years prior?" 48 page, A5-sized note pad (with cover artwork by Satine Phoenix!). The book has graph paper on one side of each page spread and hex paper on the other - perfect for your mini One Page Dungeons and Wilderness or general notetaking needs. Once a goal is reached, backers will receive an email to vote on what the next stretch goal should be. Backers will have 24 hours to respond, and then the results will be announced. Each € value listed with the stretch goal is the amount of money over the previous stretch goal that would be needed to fund it. A comprehensive index covering both this new Ref book and the Rules & Magic hardcover will be in this book. The Ref book is going to be one part advice and procedures, one part game tools, one part inspiration, plus intro material for new Refs. To help everything flow more smoothly and to help keep a unified tone, Joshua Yearsley (Nova Praxis) will be brought on board with this stretch goal. A 4 page insert with full color art, similar to the color section that appears in the Rules & Magic book, will be part of the Referee book. This goal may be reached multiple times. Older, out of print adventures need to be reprinted. Reaching this goal will get one of the following adventures reprinted: Tower of the Stargazer, Death Frost Doom, The Grinding Gear, Hammers of the God. The value of the adventure will be added to the LotFP store voucher backers received so you get it for just the cost of added shipping if the goal is reached. This goal may be reached 4 times, once for each adventure. Tower of the Stargazer will have to be first because of its "intro" focus (and more beginner and learning material on store shelves is always good), and after that backers will vote on which adventure gets reprinted next as the stretch goal is met. + 350€ Maria Appreciation Fund! My wife puts up with a lot of crap to allow LotFP to function, from going without rent for months at a time (while watching thousands of euros come and go for business concerns), the living room being turned into a warehouse for weeks once or twice a year and being littered with packing supplies year-round, the "Leave me alone I'm writing!" shenanigans, "Help me get this load to the post office? ", and in general dealing with the stress of being married to someone running a small business in a very small and weird industry. This crowdfunding campaign is not designed to generate profit in and of itself (of course the hope is the Ref book will go on afterwards to be a wildly successful and profitable book! ), but if you vote for this stretch goal, Maria gets her share of the rent immediately after the campaign ends, not three months after the Ref book goes to press. This stretch goal can be achieved numerous times, if you're feeling that nice. Note: Certain estimates about how long the book will be were factored into some of these stretch goal costs and even in estimating the base costs of the book and campaign. Should we not reach the largest possible wordcount, some of these costs will be (much) less than what is listed. But we won't know until after the campaign is over. Which means that when such costs are finalized there is a chance that new stretch goals could be funded long after the campaign has ended just by updating the accounting! The interface here does not act like a shopping cart... For example, if you choose the Level 3 perk and pay 50€, there is no indication exactly what extra you wanted in addition to the standard edition Ref book. So after the campaign ends, all backers will receive an email confirming the amount they contributed, to ask them exactly what extras they want. Within days of the campaign ending, everyone should be on the same page with no surprises as to what they will receive and what they will not. Backers at the appropriate levels will receive a PDF of the current Ref book right after the campaign ends, as well as the current PDFs of any Stretch Goal Adventures that are attained. The Thulian Echoes PDF would be distributed as soon as it is ready (a completed draft is already in hand as the campaign starts). When the books are ready, they'll go on sale at the LotFP store and you will receive a notification email with the coupon code to use. The coupon code will include the price of the Ref book plus any Stretch Goal adventures. This will be a general one-use coupon and not tied specifically to these items, so if you want to use it for different items in the store, you can. However, placing an order after this time that does not include the Ref book will mean a copy with the bookmark ribbons (or alternate cover numbered copy) is no longer reserved for you. The extras will not be on sale through the LotFP store - they will simply be added to your order. If you just backed for the extras and not the Ref book itself, just say so in response to the notification email and your stuff will be shipped out on its own. If you're having budget problems at the time the books are made available and can't put in the order for the Ref book right away, let us know when we send the notification email so we can reserve your items. People with Finnish addresses don't pay shipping through the LotFP store, so the notification email for them will pretty much just mean "update your address if you've moved." Retail backers will be contacted directly and will not have to deal with the LotFP store at all. Being honest... a great many crowdfunding campaigns greatly underestimate the time it takes to get the projects together and to the backers and end up being late. LotFP still has some stuff outstanding that's past deadline. Guessing a "real" date seemed like a losing proposition. Because there is no real deadline for the book. The Ref book is essential to LotFP as a game and as a business, and the company is basically in neutral gear until it's done. It is in everyone's interest to get it done in as timely manner as possible. We will do our best not to drag our butts. But we won't cut corners. Layout for the Rules & Magic book took longer than expected, but the same template will be used for this book so who knows how that will affect things. We might hit some of the stretch goals that affect the book's content (more art, color layout, developmental editing), that will add unknown amounts of time to the project. Someone pointed out in the run-up to this campaign that "You mean if 50 people add on commentary by Zak, he's going to write 5000 words?" and if that happens to one (or more...! One can dream...) of the commentators, that might add more time in. While all of these things add time to the project, but they also make the book better. And I hope they happen and will push for them to happen, but at the end of the day the people doing most of this stuff are freelancers who will need to fit this book into their schedules at the time it's ready for them. So the actual delivery date is "When it's done." That isn't an option to enter into IndieGoGo for a delivery date though, and any reasonable guess is still pretty much blindly throwing darts. So why not January 2019 and poke fun at myself and others who have failed to correctly divine past completion dates? So... You either want the book, or you don't. You either trust that it'll get done, or you don't. If you don't want the book or don't trust that it'll get done, then backing this project is a bad idea no matter what date we stamp on it. If you do want the book and do trust that it'll get done, we've put together some incentives to get you to back now instead of waiting until it's properly released. It's up to you to decide whether those incentives are effective. You may substitute 2 standard Ref books for 1 of the limited edition cover version. You may substitute 4 standard Ref books for 3 of the Slipcases (just the slipcases, no books in them). You may substitute 2 standard Ref books for 3 Rules & Magic hardcovers. You may substitute 4 standard Ref books for 3 Referee Screens. You may substitute 2 standard Ref book for 5 print copies of Thulian Echoes. Email lotfp@lotfp.com before making your pledge to make sure we're exactly on the same page as far as what you'll be getting. Imho, just needs the buttons that let me throw money at it! Good to know, but first I need to know that everything is clearly explained. I think you need to do draft 7 as you're not being upfront about the benefits of crowdfunding the ref's book. You're burying in a mass of information. BUT most importantly of all, you'll get to shape how the referee book will look and make it more useful to you. You get to choose which stretch goal gets funded first- Want more great art- vote for it! Colour art? Colour layabout- vote for it. Plus you can fund additional commentary on how to referee LOTP and make it a better game experience for you and your group from your choice of Frank Mentzer, Michael Curtis, Kenneth Hite, or Zak S (give some kind of gaming credits for each other here). For full details of how this all works, read on down below. Also, I think you need to revamp the section on shipping costs. You need to stress that one of the benefits of shipping not being included in the cost, is that more of their euro actually goes to funding the book/ stretch goals, rather than the shipping costs taking a hefty slice of the money raised- more bang for their euro-buck. tl;dr. Why Should I Care About This Campaign? We're doing a new LotFP Ref book to match the standards - if not greater - than the recently released Rules & Magic book. Hardcover, new layout, expanded content! Backers get to vote on which stretch goals come next. You decide whether we go for a full color layout, or reprinting adventures, or comprehensive indexing, etc. Backers can add on extras that make the book better for everyone. Want Frank Mentzer, Kenneth Hite, Zak S, or Michael Curtis to contribute? You want new monsters by Rafael Chandler and Aeron Alfrey to be part of the book? You make it happen! No matter how much extra material is added, no matter what the final retail price of the book ends up being, your price is locked in once you back the project. There are a ton of exclusives available, like a Referee screen, a new adventure, and an alternate cover available only to backers of this campaign. That looks like a good addition, though I think you should bold or underline or otherwise highlight the one I bolded. And perhaps add a "(Shipping not included, see below)" to that line. I also agree with the changes suggested/made above. "And it could use some new art, additional editorial input, and all the great things that money can buy but that small publishers have problems financing out of pocket since they're not essential to the production of a book for it to still turn out pretty good." Should probably be two sentences. How will the commentaries be added to the book? Text boxes, footnotes, "handwritten" in the margin (like in Stealing Cthulhu)? No idea yet. I'm leaning towards liking text boxes, but I don't want to commit before seeing anything. Definitely not the Stealing Cthulhu style though. So I guess the big question left is when is the crowd-funding campaign going to start? I'm waiting for confirmation on a sensitive subject from one particular person, then I have to update the campaign page to reflect their message, and then it goes live. Maybe tonight. Maybe tomorrow. Maybe they'll fall down some stairs and we'll be here all week waiting. But it's worth waiting for.